How many years have I been living on the face of the earth? How many more years shall I live? Will I have emancipation from this wretched existence? It seems eons ago. But I vividly remember that day when a pretty girl came to the fruit shop. I was briskly pulled out from the stack of plastic bags. I was fresh, crispy, clean and strong enough to carry a dozen juicy, luscious oranges. The pretty girl dangled me on her arm on her way back home. It was fun. I enjoyed the breeze and the cacophony of the streets. Then suddenly, plonk! A drop fell on me. Then another … and another. The breeze became stronger. The drops started falling incessantly. The girl started to run. She did not have anything to cover her head. But the oranges were safe. I was there to protect them. I was “water proof”. Back home, I was put out for drying. A clip protected me from being blown away. The water drops slowly evaporated and became a part of the atmosphere. I became crisp and dry again. The bright sun smiled down on me. I had reason to be happy because I had now found a new home. After a while the pretty girl came and stood by me. She was eating one of the oranges that I had carried for her. She peeled the orange and put the peels in the pot amidst the dirty soil. I was happy to be above the dirt. As the days went by, they found various uses for me and I excelled in almost everything. Sometimes they wrapped vegetables with me and kept me in the fridge. Sometimes the pretty girl put me on her head before having a shower. Sometimes I was used for keeping the chapatis dry in the tiffin box. Slowly I started growing old. I was torn at the edges. I lost my sheen. I was not so strong any more. One day when they opened the fridge to take out the vegetables wrapped in me, I overheard the news on TV. The news reader was saying, “The Maharashtra government has announced that plastic bags below 40 microns thickness will be banned from 1st April….” Banned? A chill went down my body. My existence was at stake! But why? Didn’t we make ourselves useful in so many ways? The next day, when they had put me out for drying, I caught sight of the orange peels that the pretty girl had thrown away in the soil. The peels had turned brown and thin. Some worms were crawling over the peels. The peels were turning into soil – so it seemed to me. Could I also turn into soil? Suddenly the truth dawned on me. I could never turn into soil. I could never become one with the elements of nature. My soul was forever trapped in my deteriorating body. Water droplets became one with the atmosphere and were reborn as rain. The orange peels would soon turn into soil and enrich the plant growing in the pot. But I was denied this cycle of decay, death and rebirth. I was denied an opportunity to reinvent myself. I felt rebellious. I blew away with the next gust of wind. I wanted to be free. I wanted to be a part of the atmosphere like the water droplets. I blew on and on – sometimes hovering near the surface, sometimes rising a little above. I could see from above that I was approaching a patch of greenery. Some children were playing. 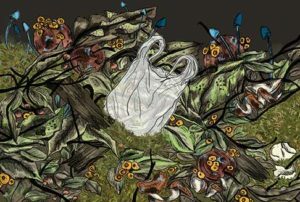 I could spot dirty white patches on the greenery – discarded plastic bags, rebellious plastic bags, angry plastic bags, sad plastic bags. I soft landed on the grass and rolled over to one of the bags. Below me was tender green grass that would grow taller, perhaps bear tiny flowers and then one day wilt and die. I would live on – God knows for how long! The neighbouring plastic bag whispered in my ears: maybe 500 years; maybe 1000 years. Who knows? I spent all night listening to the chirping of crickets and waiting for dawn to break. The night worms came out of their holes and ignored us altogether. We were too tasteless, too uninteresting for them. Back home, I was at least useful in some way or the other. Here I felt totally useless. I only hoped that the big man with moustache would find some use for me. Slowly the darkness melted away. It became brighter. For the first time in my life I was witnessing daybreak. The birds started chirping. Hundreds of them. One crow stooped down and picked up a broken plastic spoon from under the bush. The crow flew back to the treetop holding its new found treasure in its beak. The spoon became a part of the crow’s nest. So the wily crow invented a new use for the broken spoon! I was impressed. I was happy for the broken spoon. Soon the big man with the broom came and briskly got down to doing his job. He collected all of us together and put us in a bin. 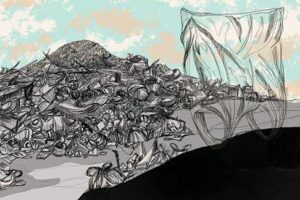 Thin plastic bags, sturdy plastic bags, at least a dozen empty plastic bottles, a broken plastic jar, plastic combs with broken teeth, dry leaves, broken twigs – all of us began to suffocate in the black hole of the bin. He put a lid on the bin and it became totally dark. Now what? One of the bags whispered, “He will take us to the landfill and dump us there. We will be made to rot, out in the open.” But we will not rot. That is the tragedy of our destiny. We cannot nourish plants, we cannot enrich the soil. I shuddered to think what my future would be. All kinds of dark thoughts enveloped me in the darkness of the bin. I wanted to script my own future. If I were to live forever, I might as well be on the move. As if to grant my wish, the bin was emptied in the garbage truck. The truck began to move. Through the narrow opening in the truck wall, I could see the city – tall buildings, colourful sign boards, swank cars passing by. It was a long journey. “But what use will there be for us? We cannot be manure for the vegetable plants. Can we?” asked another voice. “I guess there is no other place to dump us. All the city’s waste goes to the landfill, I am told,” whispered a third voice. Tears came to my eyes. Perhaps I will disintegrate into shreds and mix with the soil. But the soil quality will degrade because of me. I will clog the little pores in the soil and choke the little microscopic organisms that thrive in the soil. I did not like the idea. I had to find a way to escape. Surely there will be alternatives. The landfill could not be my ultimate graveyard. The truck stopped. It had reached its destination – the landfill. One wall of the truck was lowered and the floor of the truck slowly raised at an angle. All the garbage poured into the landfill. I could see a mountain of garbage. Smoke was coming out from places. Some people were standing on the garbage mountain and raking the garbage. I shuddered at the sight. When it was my turn to roll down the slope, I escaped. I rolled and rolled and fell into a canal of dirty water carrying the city’s waste. I floated along as the frothy water flowed past paddy fields and marshes. After a few days I reached a creek. From the creek to the sea – the Bay of Bengal. It was water, water everywhere as far as I could see. Sunlight glistened on the heaving sheet of water. I rose and fell with the waves and I moved further away from the shores. I enjoyed the lightness of my being. I knew that I would never drown. So I was not scared. I ruled the waves. What a relief from the suffocating journey in the truck. What a relief from the dirty, stenchy water of the creek. Freedom at last! It was exhilarating. Sometimes fishermen’s boats glided past me. Some boats glided past silently. Some made a lot of noise. The fishermen cast their nets to catch fish. But I learnt to dodge these nets. I managed to stay free. I enjoyed my solitary splendour. But wait! Something brushed past me. What was it? An empty bottle! How did it come here? Perhaps the same way as I came? Or perhaps some fisherman had tossed it carelessly into the sea after emptying its contents. The bottle bobbed up and down in the current and floated on. Then suddenly it tumbled and tossed. The bottle had hit against a broken plastic basket – the kind fishermen use to store their catch. And then I noticed strands of plastic ropes floating around – and then a broken plastic comb and then another bottle – a much bigger bottle – and then many many plastic bags – some bigger than me, some smaller. I spotted a broken toy, broken sun glasses, a broken plastic stool, a broken bucket and then something big and shimmering. It was a big sheet of plastic floating majestically. I was in a plastic world – a floating plastic island. As I slowly gyred around with the water, I encountered all kinds of plastic objects. Gradually it dawned on me that I had reached my ultimate destination. I was part of the great oceanic garbage patch. Come day, come night, come rain, come sun – I would float here forever with my other plastic mates, discarded carelessly by human civilization. There was a chance that I would gradually disintegrate into tiny, microscopic fragments and mix with the sea water. The fish that gulped in the sea water would gulp in parts of me. The fish will be caught by fishermen and sold in the market. Parts of me will enter the food chain and end up on the plates of human beings who have created me. I feel helpless and useless. I have nothing to do except slowly gyre with the oceanic current. Sometimes, to avert dark thoughts, I close my eyes and think of the pretty girl who had first put me to use that breezy morning. It seems aeons ago. 15,342 tons of plastic waste is generated in India every day. 1500 plastic bottles end up as waste every second. 300 million tons of plastic is consumed globally every year. The Great Pacific Garbage Patch or the Pacific trash vortex is a floating island of plastic swirling in the North Pacific Ocean. Similar patches have been spotted in the other oceans too. • The earth can be redeemed from plastic waste by inventing efficient ways to recycle the waste. • Waste plastic may be used to build roads and houses. It may also be used as fuel. • Research is also going on to create biodegradable plastic. • As conscious citizens we should avoid using plastic bags and we should practice segregation of waste at source. How to recycle plastic bags and plastic bottles? Some scientists are of the opinion that the plastic water bottles and cold drink bottles should not be reused for carrying water because some chemicals used as additives while moulding the bottles leach into the water. These chemicals may cause hormonal imbalance in the human body. The plastic bottles can instead be creatively recycled to make vertical gardens, pen stands, wind chimes and these may even be used to build walls and partitions. 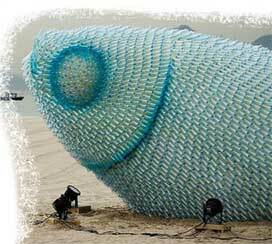 On the Botafogo Beach in Rio de Janeiro, one will find a giant fish sculpture made out of thrown away plastic bottles. Lovely stuffed toys can be made from the soft plastic bags. If craft teachers in schools introduce these plastic crafts, at least some of the menace caused by plastic waste can be stemmed. The author is a writer, teacher and documentary film maker. She is associated with an organization called Bichitra Pathshala that works to promote ‘learning with moving images’. She can be reached at subha.dasmollick@gmail.com.